The superstar took to Instagram over the weekend (17-18Dec16) to show off a short photo montage of her festive preparations, showing off a number of different Christmas trees, each featuring a different colour scheme. The first was a towering tree covered in silver and purple baubles, and snowflake and star ornaments, while a second, smaller silver tree, which fans believe is possibly for her daughter Blue Ivy's room, was dressed up in pink and green metallic balls, a cupcake-shaped ornament, and a little ballerina. Another tree was clearly an ode to Lemonade as it featured yellow and green decorations, including hanging lemon ornaments, and was topped off with a big, yellow bow. 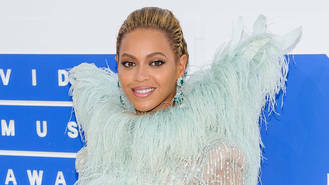 The slideshow also included snaps of Beyonce pulling a series of poses as she modelled silver reindeer antlers while wearing a navy mini dress with a plunging neckline. The decorations aren't the only Lemonade-inspired items Beyonce has debuted for the holiday season. She released Christmas clothing on her online store in November (16) which featured T-shirts, sweatpants and hoodies, adorned with lemons and Christmas touches, such as a white crop tee with an image of a red stocking stuffed with lemons and a red hoodie featuring the words I Sleigh All Day. Prices ranged from $14 (£11) for boy shorts underwear to $60 (£48) for the hoodie and sweat pants. The singer has good reason to celebrate the continued success of Lemonade, which was released in April (16), after recently landing nine Grammy Award nominations, including Album of the Year, Record of the Year and Song of the Year for Formation. She also dominated the Soul Train awards with four wins, and topped the nominations shortlist for the 2017 NAACP Image Awards.